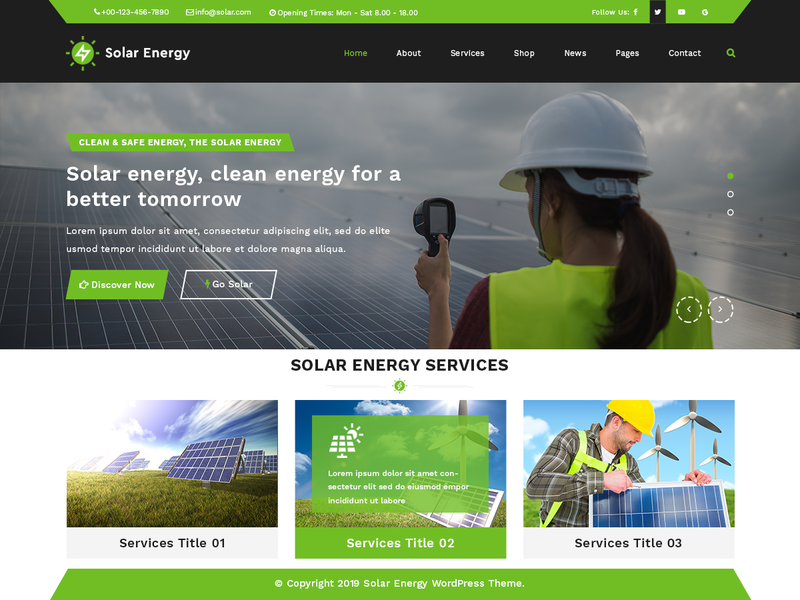 Premium solar energy WordPress theme is a top category theme related to the alternative energy businesses or consultancy and has wide application for the industries related to the conservation. It is a perfect alternative energy theme for the recycling industries and comes with a bundle of rich features that can take your business growth or consultancy to an altogether different level. Because of the special WooCommerce compatibility associated with the solar energy WordPress theme, it is a good one for the sale of solar products and you can do all this by opening up an online shop and if you sell the products related to the wind energy, you can but this solar energy theme at affordable cost from various genuine theme selling companies in the online international market. One of the special features with this solar WordPress theme is the display options and apart from that, it is accompanied with the interactive demo as well. Solar energy WordPress theme is multipurpose to the core making it a suitable option not only for the core solar manufacturing businesses but also for the associated alternative energy businesses that includes organic product selling business or businesses related to the hydro and wind energy. It is accompanied with testimonial section as well as the CTA [call to action button]. It has the animation effect and is known for its interactivity. Since the time it came in the market, it has performed excellently well as per the global customer reviews. It also has the display options apart from quick page speed.